How deep can deep reading go? 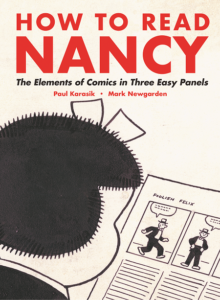 Paul Karasik & Mark Newgarden talk about the 10-year project of exploring a single Nancy strip, for their new book How to Read Nancy: The Elements of Comics in Three Easy Panels (Fantagraphics). We get into the wonders of Ernie Bushmiller’s signature strip, the transformative class they took with filmmaker Ken Jacobs, the malfunctioning tape recorder that led to the whole project, the challenges of getting Jerry Lewis to write the book’s foreword, Nancy’s role as proto-feminist, and more! Plus, I get them to talk about the secret story of the first time they met, where their collecting impulse came from, the pleasure of finding a good flea market, Art Spiegelman’s strength as a teacher, how each of them teaches comics and how a lot of students have no sense of comics history, and how they keep the “ick” in “academic”! Give it a listen! And go buy How to Read Nancy ! Lots of ways to follow The Virtual Memories Show! iTunes, Twitter, Instagram, Facebook, Tumblr, and RSS! Paul Karasik is a cartoonist, editor, and teacher. His works include the graphic novel adaptation of Paul Auster’s City of Glass (with David Mazzucchelli) and The Ride Together: A Brother and Sister’s Memoir of Autism in the Family (with his sister Judy Karasik). He also edited the complete collection of Fletcher Hanks comics, Turn Loose Our Death Rays And Kill Them All . He lives in Martha’s Vineyard. Mark Newgarden is an acclaimed cartoonist whose work was collected in We All Die Alone . He is also the the co-author (along with his partner, Megan Montague Cash) of Houghton Mifflin’s bestselling Bow Wow series of children’s books. He lives in Williamsburg, Brooklyn. Credits: This episode’s music is Nothing’s Gonna Bring Me Down by David Baerwald, used with permission from the artist. The conversation was recorded at Mark Newgarden’s home on a pair of Blue enCORE 200 Microphones and a Blue enCORE 100 Microphone , all feeding into a Zoom H5 digital recorder. I recorded the intro and outro on a Heil PR-40 Dynamic Studio Recording Microphone feeding into a Cloudlifter CL-1 and a Mackie Onyx Blackjack 2×2 USB Recording Interface . All processing and editing done in Adobe Audition CC . Photo of Mr. Karasik & Mr. Newgarden by me. It’s on my instagram.